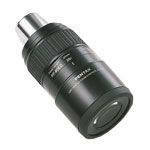 Pentax has two sets of 1.25" eyepieces for spotting scopes. The XF eyepieces are designed for their PF65 scopes and include two fixed eyepieces and a zoom. The XW eyepieces include fixed and zoom models designed for the PF80 scopes. All Pentax eyepieces are Super Multi-Coated (SMC). 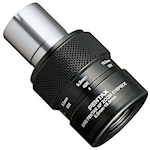 The XF series eyepieces are Pentax’s highest-quality scope eyepieces for their ED spotting scopes. XF eyepieces are made with ED glass for high-resolution images with less distortion or chromatic aberration. The XF lenses have full-surface multi-coatings for enhanced light transmission. Pentax XF scope eyepieces include: 20-60x zoom and fixed focal length versions at 32.5x and 46x (magnifications apply to PF-65ED II scopes only). The XW series eyepieces are made for Pentax’s ED spotting scopes. The XW eyepieces are made with ED glass to provide high-resolution images. XW eyepieces are fully multi-coated lenses. The Pentax XW lens series includes fixed focal lengths of 111x, 78x, 55.5x, 39x, 28x and 19.5x or a 16-48x zoom (magnifications apply to PF-65ED II scope only).